Achieving clinical documentation cost, quality, and cycle time objectives depends on how well people and technology are managed. But since change is inevitable, long-term success is ultimately determined by the ability to adapt to an ever-changing balance between the two. Labor and technology changes drove the evolution of the outsourced transcription service market and the emerging coding services market is tracking in those same footsteps at an accelerated pace. The competitive pressures of today's outsourced market are certainly driven by the adoption of certified EHRs and the pending implementation of ICD-10. How painlessly HIM departments overcome these challenges—or how well the pain can be minimized—often will be determined by how outsourced service vendors can be leveraged to meet internal goals. To that end, with potential cost savings of 50% or more, why would any health care organization allow transcription and coding efforts to be managed by an in-house staff? Is something missing from the outsourced marketplace or do providers simply have inherent workflow and/or performance expectations that prevent outsourcing? Do some hospitals prefer to keep jobs local while others, especially those that are for profit or under financial stress, are more likely to decide based on service costs? What if a service vendor consistently falls short of cost, quality, and/or turnaround time (TAT) expectations? Many hospitals still avoid even considering a change. Does the perceived pain of change always trump the pain you know, even when there are plenty of other vendors with strong track records from which to choose? HIM service vendors have struggled against these growth barriers for decades. But certified EHRs and the multiyear ICD-10 stutter start have introduced a whole new level of chaos and complexity for those attempting to gain market share. These two legislatively driven efforts have turned today's transcription market into a fraction of what it once was while positioning the coding market for exponential growth. How the outsourced HIM services market evolves can be mapped by following the steppingstones of the industry's technology advancements. In stage 1 during the 1980s, enterprising transcriptionists realized they could earn extra money by moonlighting for nearby hospitals and clinics. After wrapping up their day job, some would drive around to pick up cassette tapes and drop off reports that were typed at home on their IBM Selectric typewriters. These small-business opportunities launched the transition from in-house, hourly-based employment to outsourced production-based efforts as measured by the technology of the day. After first paying by the page, then by the horizontal lines contained in a document, early clients of outsourced transcription services soon learned that both could be manipulated by simply adjusting the margins. Accordingly, the 65-character line standard was established as a common production metric because that's how many characters fit horizontally on an 8½-by-11-inch sheet of paper with the margins set at one inch on each side. With 6½ inches of space available for the IBM Selectric to type 10 characters per inch, the 65-character line was born. Although the need to physically pick up cassettes and drop off reports limited the overall business growth of these early players, those who were high producers quickly realized there was real money to be made as a dedicated outsourced service vendor. Geographical restrictions continued with the initial switch to digital dictation systems in the 1990s since the only way to economically access voice files was through a local telephone call, most often made with a C-phone. In stage 2, when transcription service vendors found their way onto the Internet sometime around 2000, the size of the companies, along with their collective share of the market, boomed. During this time, many mom-and-pop shops and a handful of regional players continued to flourish while a few larger organizations, backed by a flood of eager investment money, began acquisition strategies for technology and service companies alike. By the end of the decade, two mammoth competitors each owned multiple technology platforms while only a handful of moderately sized players continued to make a profit. Because they could not compete with the economies of scale and technology advantages, mom-and-pop operators were left to fight over local (predominantly clinic-based) business. It's important to note that at the beginning of this decade, most health care provider organizations that outsourced still preferred to own and host their dictation/transcription technology. By the end of the decade, however, most if not all such systems were backed up to "the cloud." As competition tightened, some service vendors began offering Application Service Provider model services, where the cost of the technology was included in their rates and supported virtually. Unfortunately, that led to a shell game by some vendors that worked hard to protect their margins by selling technology and services separately through the IT and HIM departments, respectively. In the past 10 years (stage 3), productivity enhancement tools such as back-end speech recognition (BESR) and natural language processing, with its ability to automatically abstract content from narrative reports into certified EHR structured reports, have further reduced service costs and added value to the delivered end product. Today, depending on whom you ask and the business models of competing BESR vendors, more than 70% of all reports delivered by larger outsourced transcription service vendors are processed through a BESR engine before editing and delivery. Although clearly not the eliminator of all transcription labor, this development has helped reduce the open market cost of document production. So much so that it's not difficult to find reputable domestic vendors using BESR that can compete with offshore pricing, since many of these firms still rely primarily on manual labor. Of course, that also means a large number of local vendors as well as scores of smaller regional and national players that don't have access to BESR technology (or that work primarily on client-owned platforms) find it increasingly difficult to stay in business. Without BESR, many of these vendors have had to sell off or simply close their doors due to the unwillingness of clients to offer meaningful salaries to domestic manual transcriptionists. The evolution of outsourced HIM services and the corresponding drop in market prices can be traced through the three distinct stages of mixed labor/technology business models. Offshore businesses typically gain notable market share in the transition from stage 1 to stage 2 before the gap between onshore and offshore prices narrows in stage 3 when the savings from automation efficiency and the reduced domestic wages required to stay in business all but eliminate the gap for cheaper offshore labor costs. Although offshore labor will always be less expensive than domestic labor, greater local competition for experienced staff also inevitably increases labor costs in the offshore markets. In the end, prices drop and some labor shifts back domestically through applied technology. This type of global market shifting dynamics, first described in Thomas L. Friedman's bestseller The World Is Flat: A Brief History of the Twenty-First Century, have played out in many service-related industries since the Internet boom. Looking forward, many HIM observers have noticed that the offshore quality gap appears to be considerably less in the early stages of outsourced coding than it was for transcription. With coding, there's no worry a report will suggest that a patient works at "Star Box." At the same time, the almost universal postsecondary health care-related degrees of the offshore workforce delivered comparably better transcription accuracy for medical terminology than everyday content. And since coding activities are focused solely on medical terms already present in the documentation, those inherent skills translate well for accurate coding results. The other critical factor that goes hand in hand with increased automation and results in consistency between stages is the establishment of industry-wide standards. Efforts led by the outsourced transcription service vendor community and eventually released as joint white papers by AHIMA, the Association for Healthcare Document Integrity (transcription labor), and the Medical Transcription Industry Association (outsourced vendor executives) established quantifiable and measurable cost, quality, and TAT expectations for the transcription market that directly translated into contract language. Similar production baselines (charts per hour), cost (per chart), and quality measurement best practice standards should be expected in coding to prevent the type of pricing shell games that transcription vendors used to play. As outsourced coding grows, expect AHIMA to take the lead here to ensure vendors and consumers of outsourced coding services are on the same page. As outsourced HIM services emerge, vendors rely on client-owned technology and individuals logging in remotely. Transcription outsourcing began in this manner and that's how coding outsourcing operates today. Of course, there are computer-assisted coding and other productivity improvement tools, but rarely do they result in a notable decrease in the number of people required to complete the process. In this stage, production staff is hired for specific accounts and work types/queues—if an account is lost, so is the outsourced worker's job. Positions are posted only when new business is secured. The timetable to review résumés, conduct interviews, make offers, and wait for new staff to get up to speed takes time, making scaling painful for smaller businesses. Essentially all of the early players in the early outsourced transcription and coding markets were 100% domestic. Significant growth in offshore transcription began about 10 years ago, while offshore coding began gaining steam shortly after the first target dates for switching to ICD-10 were announced as domestic coders demanded and received higher compensation. The financial benefits of outsourcing at this stage come from the elimination of the in-house overhead (recruitment, training, company computer, benefit packages, etc) and moving from predominantly hourly-based wages to pure production-based pay. This also relieves the hospital from either staffing for their highest census rates or suffering from extended production times if they maintain minimum direct staff. In the end, high producers for the young vendors make good money and the provider organizations still save substantially. Here, vendor success is fully dependent on staff quality. While this stage was triggered when transcription went to the Internet, it has yet to occur in the coding market. When vendors reach a certain size, they struggle with the daily workload fluctuations of labor pools dedicated to different client-based platform configurations. Because contracts are production-based, workers know they can be more efficient—and make more money—if they stick to one system. Accordingly, vendors that can interface with their client's platforms and consolidate as much of their collective volumes onto a common technology platform have a competitive advantage. This streamlines vendors' management efforts and allows them to pool labor across multiple clients for specific work types/queues. Also, employees are less dependent on specific contracts to keep their jobs. From a cost standpoint, if providers can eliminate (transcription) or reduce (eventually with coding, even if only for the encoder) technology costs, real savings can be achieved. At the same time, vendors processing larger volumes—especially if it's on a common platform—can drive technological advancements to improve productivity. Here, vendor competitive advantages come from controlling labor costs and engaging productivity-enhancing tools. Although still quite a ways off for outsourced coding, this is the current business model for outsourced transcription services. Vendors often own or lease a single technology platform for their workforce and seamlessly balance labor across a wide range of clients through an automated workflow process. Cost savings gained from automation tools and the ability to virtually balance labor leads to a dramatic drop in market price. First-to-market, automation-enabled vendors capture market share with lower prices, forcing competitors to follow suit or go out of business. And because the economies of scale deliver additional savings, much of the smaller end of the market is inevitably squeezed out. Unfortunately, the frontline labor force suffers most during stage three as wages drop along with market price expectations. The workforce is expected to produce significantly more through the use of automation tools but is compensated less as the focus shifts from a labor-dependent model to one centered on technology. Competition is driven by minimizing labor costs and maximizing process automation. Every certified EHR is somewhat cost justified by the elimination of transcription and the reduction of manual coding expenses. Certification proponents tout the benefits of physician self-documentation and automated coding that are guaranteed to eliminate transcription labor, enable a seamless transition to ICD-10, abolish 'discharged, not final billed' days, and create a spreadsheet Shangri-La to improve overall population health. However, doubters argue many physicians eventually find themselves documenting an extra hour or two each day and seeing fewer patients. Results vary based on the EHR, individual physician adaptation, and specialties. However, some physicians have reported losing $75,000 or more per year in personal income due to the extra time spent documenting instead of seeing patients. This may lead to quality and revenue cycle problems as physicians fail to proofread their own work and/or find shortcuts to minimize documentation time. In turn, this may result in poor patient care, increased claim rejections, and financial pain at the end of the fiscal year when outstanding rejected claims are settled for pennies on the dollar with payers to close out the books. To optimize certified EHRs, there must be balance between technology and human interaction to efficiently create accurate clinical records across the board, especially because experiences differ greatly based on physician age, adaptability, and specialty. A lack of practical physician-centric EHR workflow flexibility is one reason scribes have become a trendy option despite the fact such roles were replaced by transcriptionists 50 years ago. EHR vendors can't recommend transcription because most promised to eliminate those costs. The pragmatic realities of this catch-22 were best summed up by an outsourcing company's senior manager who, requesting anonymity, said he had a choice: Sell providers what they are asking for or spend lots of time and money educating them why scribes are less cost-effective than transcriptionists. That firm is growing quite well because it chose to offer scribes to meet the market demands. If there seems to be one certainty in the certified EHR-driven marketplace, it's that ICD-10 documentation will be a challenge. The true time impact for ICD-10's increased specificity in physician-centric document creation workflows is potentially game changing. 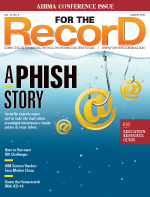 Hopefully, it will be as smooth as the EHR vendors claim, but there are many doubters. Preparing for and eventually transitioning to ICD-10 presents unavoidable labor issues. Besides coder training, system configuration efforts— even if technology platforms are not being upgraded—recalibration of the charge master, and revenue cycle workflow testing are daunting tasks. Unfortunately, the organizations that were most proactive with their in-house team members when the first target dates were set will be the ones that most likely end up paying the highest price. Staff who took early ICD-10 training courses most likely will need a refresher course before the October 1 deadline. Most outsourced vendors are in the same boat as in-house teams with staff in different stages of preparedness. The good news for vendors, however, is that when providers begin to dual code, the expected short-term explosion in labor support will likely be for ICD-9 coding since the in-house staff will be focused on getting up to speed on ICD-10. As a result, some vendors realize it will be difficult to navigate dual coding without outside help, making it an opportunity to prove the value of their services. Accordingly, this exercise alone is expected to help accelerate a dramatic shift from exclusively in-house departments to some level of shared in-house/outsourced labor models. It's worth noting that in contrast to the current transcription outsourcing market where the predominant relationships are for full department outsourcing, outsourced coding relationships are just as predominantly limited to partial outsourcing or overflow only. Reminiscent of many stage 1 outsourced transcription relationships, provider organizations tend to prefer to dip their toes in the water before gaining enough trust to dive in. The double-edged sword of such relationships means that buyers are limiting their risks while vendors are spreading their resources thin to accommodate smaller volumes with differing platform configurations. The current chaos in the outsourced transcription and coding service markets is influenced as much by the movement to certified EHRs and ICD-10 as the ongoing battle between technology and service vendors that pit HIM and IT departments against each other to maximize profits. A representative battle of those combined forces was fought on the campus of one provider where HIM department representatives were "uninvited" from ongoing EHR implementation meetings after raising too many exceptions. The logic behind that decision was that since the certified EHR movement was clearly an IT objective and the new workflow was easy to follow on paper, the project didn't require HIM's input. However, once the realities of what physicians would and would not do came into play, it was the HIM department that needed to clean up the mess. The looming ICD-10 transition promises to be just as chaotic. Despite coders, technology, and financial workflow having been tested, the pragmatic day-to-day problems won't reveal themselves fully until physicians are out of test mode and their document creation efficiency and corresponding downstream revenue cycle management results are validated over time. In all cases, clinical documentation success comes from finding the right balance between the available people and technology, be it in-house, outsourced, onshore, offshore, or some combination. In all likelihood, the success of outsourced HIM service vendors will be determined by whoever can proactively adapt best to the constantly changing market conditions. The same might be said for the HIM directors responsible for making it all work. — Dale Kivi, MBA, vice president of business development for FutureNet, is a 20-year veteran of the clinical documentation industry and frequently published author and conference speaker on cost, quality, and cycle time management issues for transcription and coding efforts.